Since our last update we have traveled a considerable distance. We continued to dredge seamounts through the solar storm event mentioned in the previous post, and uncovered two very interesting ridge features. The first extends out to Omura seamount, at the western end of a linked chain of smaller seamounts. A similar chain of both individual and linked seamounts stretches eastwards from Risso to Spinner. This second ridge is especially interesting because it runs sub-parallel to the fracture zones that break the nearby Mid-Atlantic ridge. It is possible that they are near-ridge seamounts, formed due to linear fracturing of oceanic crust rather than the rising plume of magma that is thought to have formed the rest of the Walvis Ridge. Following these interesting discoveries we finally had our first real break of the trip. The solar storm had abated and we turned back westwards to spend a day and a half following one of our dedicated magnetic survey lines. During this period we spent our time ping editing (cleaning up errors in our multibeam data) and making progress on the Foosball tournament that had been planned for some time. We are currently on another magnetic track line, heading further west and finally south, down to the youngest seamounts on our track. It is the furthest point from land that we will visit, and after this we will turn towards the East again and be homeward bound. 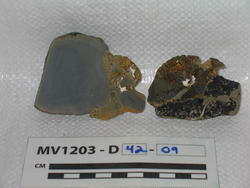 We have also recovered some beautiful rocks from Esk seamount (see image at right). Many of them are mostly unaltered, with well-preserved crystals, and after so many dredges full of manganese crust our spirits were lifted as the rocks came off the rock saw.